The Report on the State of Environment is a basic document that presents the state of environment in Kosovo. Its compilation is based on the Law on Environmental Protection and the objectives and priorities in the environmental sector. The report is prepared annually. The Kosovo Environmental Protection Agency (KEPA) is responsible for coordinating and drafting the report. The data presented in the report are based on the National System for State of Environment Monitoring. The report also includes data that are received from institutions that have specific responsibilities in the environmental sector. The Report on the State of Environment 2011-2012 is the latest official report published by KEPA. The report is partly based on the DPSIR framework. It is more focused on the State of the Environment and Responses, and less on the description of Drivers, Pressures and Impacts. It only makes use of a few environmental indicators. The key environmental topics addressed by the report are: air, water, soil, nature conservation, waste, public health, and measures for environmental protection. Kosovo is still in the phase of economic recovery. It is one of only four countries in Europe that recorded positive economic growth rates in every year of the crisis period 2008-2012, averaging 4.5%. Gross Domestic Product (GDP) in Kosovo expanded by 3.8% in 2012 from the previous year. However, Kosovo remains one of the poorest countries in Europe, with a per-capita gross domestic product (GDP) of about €2,700. Under such circumstances, there continues to be strong demand for natural resources. Currently, in addition to industry and transportation, the energy sector has the greatest impact on the environment. 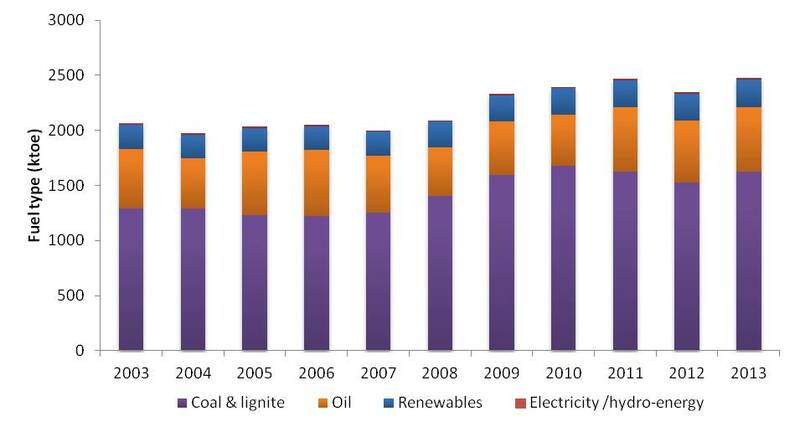 Coal accounted for 64.8% of primary energy consumption in 2012, although coal use fell by about 6% compared to 2011. Lignite was the predominant product, accounting for 97.4% of the total coal used. Renewable energy sources represent only about 9% of primary energy consumption (Fig.1). The air-quality monitoring data shows that the highest limit-value exceedances were recorded for PM10 and PM2.5, especially during the winter season. According to the results, total greenhouse gas (GHG) emissions in Kosovo in 2009 were 10.5 Mt CO2 equivalent. Carbon dioxide represents around 80% of all emissions, while methane and nitrous oxide together represent around 10%. The most important GHG inventory sector is "fuel combustion activity", which accounts for roughly 80% of all emissions. Kosovo has not yet determined the reference year for its GHG inventory. Kosovo's population continues to grow, and therefore there has been an increase in settlement expansion, and land use changes. In 2012, settlements covered 4.7% of Kosovo's territory, compared with 3.7% in 2002. Agricultural lands decreased from 31.3% of Kosovo's territory in 2002 to 27.8% in 2012 (due to the expansion of settlements). Forest lands increased from 42.1% of Kosovo's territory in 2002 to 44.7% in 2012. In 2012 around 78% of the population was supplied with water from the public water supply (4 % more than in 2011), while around 56% of the population had access to waste-water services (5% more than in 2011). Kosovo is still in the early stages of adapting and implementing environmental standards under the requirements of the European Union. At this stage, the efforts of national institutions are focused on completing the legislation and transposition of EU Directives into national law, strengthening the strategic and institutional framework, and increasing investment in the environmental sector. According to the 2012 assessment, about 60% of the overall EU environmental acquis has been transposed into Kosovo's national environmental legislation. In 2013, Kosovo approved: the Strategy for Environmental Protection and Sustainable Development 2013-2022, the National Environmental Action Plan 2013-2017, the Air Quality Strategy 2013-2021, and the Biodiversity Strategy and Action Plan 2011-2020. The following initiatives are still in the approval stage: the Waste Strategy and Action Plan, the Framework Climate Change Strategy, the Water Strategic Plan and the Management Plan for River Basins. These documents determine for each policy area the necessary measures for environmental protection and the measures to be taken for climate-change adaptation and mitigation. In order to strengthen its Environmental Monitoring System, Kosovo's network of air-quality monitoring stations is being expanded. Currently, the National Air Quality Monitoring Network consists of 12 automated static stations. In 2012, Kosovo announced the creation of its second national park Bjeshkët e Nemura (62.488 hectares), and it also expanded the territory of its first national park, Sharri. These two actions increased the total share of protected areas in Kosovo from 4.4% to 10.9% of national territory (fig.2). Besides its two national parks, Kosovo has 97 other Nature Protected Areas of various categories. Investments in the environmental sector are oriented toward the rehabilitation of industrial waste landfills, the closure of old landfills, and the construction of facilities for temporary storage of hazardous waste. Meanwhile, investments in the water sector are mainly focused on the public water supply network, the drafting of feasibility studies, and the construction of waste-water treatment plants (the lack of waste-water treatment plants is one of the major problems in the water sector). In order to strengthen the protection of biodiversity and the management of protected areas at the regional level, Kosovo is actively participating in several regional and trans-boundary initiatives and projects. Some of these initiatives are described below. The establishment of the Bjeshkët e Nemuna Mountains trans-boundary protected area. The proposed protected area Bjeshkët e Nemuna Mountains is expected to involve Albania, Kosovo, Montenegro and Serbia. The Bjeshkët e Nemuna Mountains encompass areas of unique landscape and are one of the most important regions for the protection of biodiversity in the Balkans and in the whole of Europe. This region is considered to be the most inaccessible mountain range in Europe, and the wildest range on the Balkan Peninsula. It is an extremely harsh mountain environment, with extremely hard living conditions for its inhabitants . The establishment of the Sharr–Korab–Deshat trans-boundary protected area. The region of the proposed trans-boundary protected area Sharr–Korab–Deshat is located in the border areas of Albania, Kosovo, and the Former Yugoslav Republic of Macedonia. It encompasses areas of unique landscape and natural values for Europe. This area harbours two mountain ranges of the alpine landscape, vast mountain grasslands, and forests that include primeval tree stands of the endemic pine. This trilateral border region is home to a considerable number of natural habitats and endemic, relic, rare, and threatened flora and fauna species. Some of these are species of common European importance like the brown bear, wolf, and Balkan lynx, the habitats of all of which are in areas that straddle the state border. The Dinaric Arc parks project. The main objective of the Dinaric Arc parks project is to create a network of protected areas by connecting all the nature parks and national parks in Albania, Bosnia and Herzegovina, Croatia, Kosovo, Macedonia, Montenegro, Serbia and Slovenia. The Dinaric Arc is a region of south-eastern Europe that covers some 100 000 km2 and more than 6 000 km of coastline, stretching over the entire area facing the Adriatic Sea from Trieste (Italy) to Tirana (Albania). Regional Environmental Network for Accession, 2012, Monitoring transposition and implementation of the EU environmental acquis, Progress Report 7, Kosovo, Year 15.